Chocolate cake-A scrumptious chocolate cake,moist, velvety,simple chocolicious and melts in the mouth and chocolate lovers heaven. 2. Grease abaking tin and dust it with flour ,keep aside. 3. Mix together the sugar and butter and mix till smooth. 4. Mix together the eggs, yoghurt and vanilla essence and add to the butter sugar mixture. 6. Gently fold the dry ingredients with the wet, do not over mix. 7. Pour into greased cake tn and cook for approx 40 minutes. 8. Leave to cool . 3. Mix throughly and spread over the cake. Dil Se show me your cake event. Easy Cooking -Best chocolate cake event. 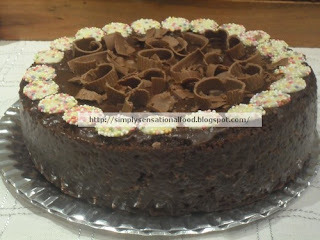 yummy chocolate cake..gotta ask me mom to make it for me...nice one thnks!! I am not sure why its not showing updated recipies but i will add your email to the mailing list and that way you will get the updated recipies. Yummy! You made me hungry! Could you post a horizotal snap of the cake too! looks delicious..will give it aq try. What a sumptuous looking cake!